Author Phoebe Damrosch, a former restaurant server, tells how she became wine-confident with the help of her sommelier boyfriend—and a few easy rules. 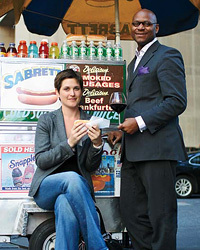 Enter André Mack, a Per Se sommelier. He was asked to advise me on tricky wine pairings and school me in arcana like the legality of Burgundian estate planning. My wine knowledge remained terrible, and André hovered by me at Per Se at all times, which suited us just fine. It did not, however, suit the other captains. They were happy to come in on their days off for Per Se’s regular staff wine classes. But they did not appreciate opening every bottle in their stations while André lingered in my section, pouring chocolate milk from a martini shaker for a child. When a guest wanted advice about what to drink with the lamb, I knew enough to recommend a Bordeaux, a Rhône or maybe an Australian Shiraz—all from places where people traditionally eat a lot of lamb. But that’s as far as I got; there were pages of these wines on Per Se’s list, from producers of all styles, from decades of vintages. “What’s best for the guest would be for you to crack open a book,” he retorted. Every so often, André would have a day off when I was scheduled to work. If no one would trade shifts with me, I had two coping mechanisms. First, the Scheherazade approach: Keep the on-duty sommelier in my section using charm and intellect. Second, my go-to wines: a handful of selections I had tasted more than once, ones I noticed my coworkers commonly recommended. I often started with Pierre Gimonnet & Fils, a grower Champagne (“farmer fizz,” André called it, as opposed to sparkling wines made on a larger scale) that went well with the caviar on the tasting menu. The Zind-Humbrecht Zind, a rich blend of Chardonnay and Auxerrois, paired nicely with both delicate fish and rich lobster. For a red, I often suggested a Moccagatta Barbaresco, an earthy Italian wine that complemented lighter meats like pork and quail, but also stood up to beef. After 18 months at Per Se, I had saved enough money to pay for my degree and learned enough about food to eat well for life. With a vague sense of defeat, I quit my job and left the leather-bound wine list in more capable hands. But the experience haunted me. Every time I reconnected at a restaurant with my nine-to-five friends, whom I hadn’t seen in months, they would beg me to order the wine for the table. On one such occasion, the sommelier strode over. Had we made a selection? I froze. “Do you like red wines or white wines?” He asked me slowly, with raised eyebrows and wide eyes, as if I were very young or dim-witted. And then it hit me. I had just been pegged as a Chardonnay-with-ice drinker. This would not do. “Give me a minute,” I said, grabbing the list. I had ordered smoked fish and my friend a salad with vinaigrette, which meant the ideal pairing would be a high-acid, low-oak white. Scanning the whites, I happened to recognize a few of the producers—Marcel Deiss, Albert Boxler—and settled on J.J. Prüm Kabinett Riesling. When I got to the reds, one jumped out at me: the Movia Veliko Rosso, a biodynamic Slovenian wine that’s a blend of Merlot, Pinot Nero and Cabernet Sauvignon. We served Movia’s Ribolla at Per Se. I ordered the Riesling and got the standard “excellent choice,” but when I ordered the Movia, the sommelier hesitated. “Have you had the Movia before?” he asked. Having closely observed sommeliers in their natural habitat, I recognized his behavior. This unusual wine was the sommelier’s little pet. He wanted it to go to a good home and be appropriately adored. I had to laugh. The irony was that I had none of this confidence when I was in the business. I had been so paralyzed by how much I didn’t know that I hadn’t allowed myself to use the vast knowledge I’d absorbed. It might have been a simple case of perfectionism: If I didn’t know everything, then I didn’t know anything. Or maybe it was good old-fashioned insecurity—who was I to sell a $2,000 bottle I had never tasted from a region I had never visited? Whatever the reason, I’ve since relaxed into my role of amateur aficionado. I admit that there are some aspects of wine I will never fully grasp. But I have come to appreciate what I learned at Per Se, and in my after-hours tastings with André (whom I’ve since married). I know what I like, and I have developed a few strategies. First, I often start with sparkling wine. Champagne is the ultimate aperitif, in part because the high acid and bubbles wake up the taste buds. Depending on who’s picking up the check, I might try a less expensive cava instead. When pairing wines with food, I remember something André once told me: If it grows together, it goes together. For example, whites from the Spanish coast, such as Albariño, work well with seafood. At restaurants, I always check the wine list for half-bottles. I often want to start a meal with a white wine, to go with a salad or light soup. But if I order a heavier, meatier entrée, I might want to move to a red. It can be more cost-effective to order half-bottles instead of glasses, and they give me a chance to experience wines that I might not be able to afford in full bottles. Some of my favorite wines are off-dry whites, like Auslese Riesling, Gewürztraminer, Tokay and Scheurebe. Some people find them too sweet early in the meal, so at Per Se we frequently served them with cheese, a pairing I find to be a sweet and savory alternative to dessert. Finally, I ask for help. If I don’t know any of the names on the list, I make specific requests based on my preferences: for example, an Old World, light red under $80. And if all else fails and my waiter suggests a nice “dry” wine, I send a text message to André under the table. Phoebe Damrosch, the author of Service Included: Four-Star Secrets of an Eavesdropping Waiter, is a writer in Manhattan.